What do you think of when you think of Marvel? Do you think about Spider-Man? Perhaps the Avengers? Or maybe, you just think about how much fun their movies are. Maybe you think of Marvel as the studio that cranks out action-packed blockbusters that for the most part, can be fun for the whole family. If that’s you, then throw out everything you think you know about Marvel, because Daredevil is nothing like they’ve ever done before. It’s nowhere close to “family friendly.” But by choosing to release Daredevil through Netflix, Marvel has given their newest show way more room to breathe, and the results are pretty dang impressive. Daredevil is the story of Matt Murdock, a blind lawyer by day who uses his heightened senses to become a masked crime-fighter by night. Cloaked in dark shades of drama and action, Daredevil is a fantastic show whose only faults are the typical “season one” growing pains. It’s Marvel Studios’ first attempt at bringing a darker hero to the screen, and it’s an absolute success. Charlie Cox as Matt Murdock. Since the title character is both a lawyer and a superhero, Daredevil could have easily turned out to be your average crime drama. Thankfully, it goes far beyond the conventions of the classic procedural, choosing instead to dive into a narrative that spans throughout the whole season. Each episode feels like a complete story while also filling in the spaces of an overarching plot. The story is an interesting one, filled with plenty of action, meaningful dialogue, surprising twists, and unique characters that keep you engaged throughout the season. There’s also plenty of easter eggs scattered throughout the show that reference Marvel’s Cinematic Universe. It’s a nice little touch that fans of the MCU will enjoy, and one that also helps fill in the gaps of the movies in a way that feels more necessary than gimmicky. While the plot was enough to keep me tuned into Daredevil, it was the shockingly realistic and brutal action that served as the hook. The series starts off with a fight scene that clearly establishes the setting and tone of the season: crime is expected, violence is commonplace, and bloodshed is inevitable. I cannot stress this enough. This show is not for kids. That being said, the lack of censorship allows Daredevil to show off its brilliantly choreographed fight scenes, which are some of the best I’ve ever seen in a superhero movie or show. Vincent D’Onofrio as Wilson Fisk. In addition to a good story and excellent action, Daredevil’s cast delivers some outstanding performances. 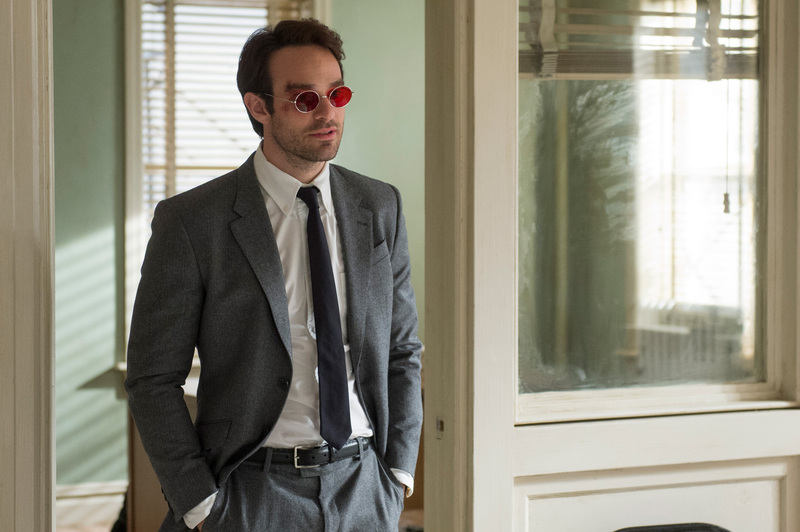 Charlie Cox plays the perfect Matt Murdock as he struggles to find the line between what he has to be and what he wants to be as a superhero. Elden Henson, Deborah Ann Woll, and Rosario Dawson all play friends of Murdock’s, and they all do so wonderfully. 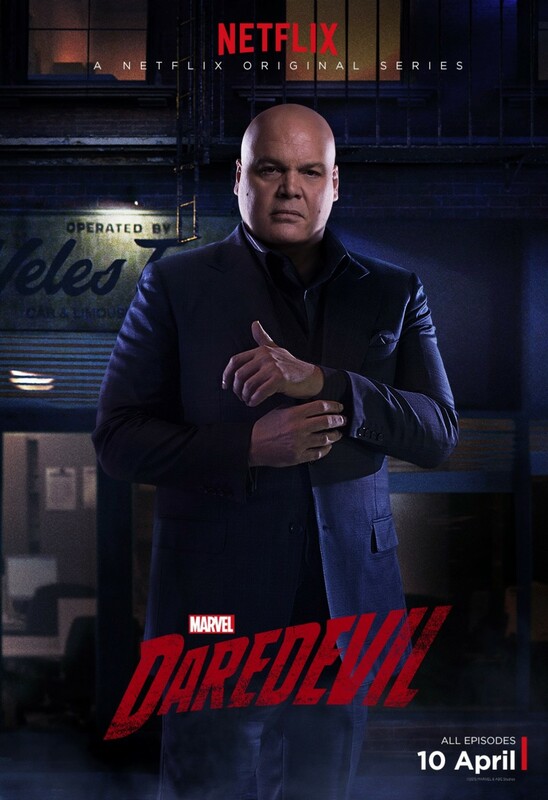 But among all the good performances Daredevil has to offer, Vincent D’Onofrio completely steals the show as Wilson Fisk. Like seriously, this man deserves an Emmy. He’s one of the best parts of Daredevil and he definitely takes the cake as one of my favorite Marvel villains ever. Finally, it was especially nice to see how each character felt like they had grown a little by the end of the season. Character development is key, and it’s something that turns a good show into a great one. This is Daredevil’s first season, and as such, a few “growing pains” are to be expected. These aren’t things that will doom the show, but they’re definitely things the writers will have to work on as they return for season two. While most of the characters in Daredevil are complex enough to keep your attention, a few important characters of the female variety were underdeveloped. They were characters who played big roles in the events of the show, but we only saw one side of them. We never felt like we knew them in the same way we knew Murdock or Fisk. They were just kind of there to move the plot along. Maybe that’s something they’ll fix in season two. My only other problems with the season were pretty minor and subjective. Since a lot of Daredevil’s plot lies within its dialogue, you’re asked to pay attention to a ton of political jargon that gets spewed between characters in hushed tones. It’s easy to get lost, and when you get back, you feel like everyone is just talking in circles. In addition to this, some episodes are a slow burn, making their way to a point sluggishly. Sometimes this built drama, and other times it just bored me. Daredevil is the first of several Marvel TV shows to be released on Netflix, and if it’s any indicator of what’s to come, then we’re in for a heck of a ride. The show sets a unique tone different from any other Marvel property, making it one of the most refreshing superhero stories out there. While I still love The Flash and I’m holding out hope that Arrow will return to its former glory, Daredevil is now my favorite superhero show on television. This is a must-watch for any Marvel fan. What do you think of Daredevil?